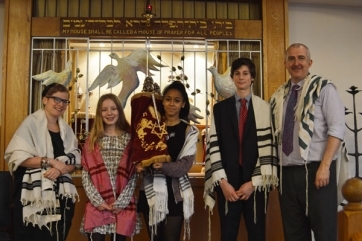 South London Liberal Synagogue provides activities and education for children from birth to 15 years of age. This includes studying for Bar/Bat Mitzvah and Kabbalat Torah. Many of our young people decide to become assistants after their Kabbalat Torah, sharing their enthusiasm and knowledge with Gesher’s children. Gesher, our lively Religion School, meets weekly and welcomes children where either parent is Jewish, and encourages all family members to become involved. Our curriculum is designed to help our children develop a pride in being Jewish and provides them with the ability to apply Jewish values in the modern world. Children spend half the morning learning Hebrew and half exploring Jewish life, festivals, values and history. 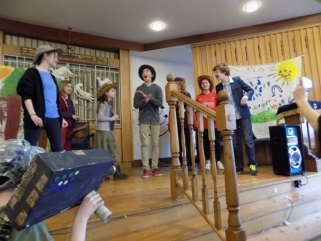 Our Hebrew curriculum is taught through various activities, including art, games and music. Our children also take part in regular Family Services with their parents, using a Siddur they illustrated themselves. To enrol your children in Gesher, or simply to find out more, please contact the synagogue office. Our Toddler group runs once a month during term time. Activities are often festival based, and parents are welcome to stay. Please contact the synagogue office for further details. Please contact the synagogue office for details of services, events and information about membership of the synagogue.